Hello everyone! CNY is this weekend and I bet those of you who are going back to your hometown are excited to see your loved ones. I discovered something that I would really want to share with you guys, and I was thinking when would be the best time other than now because CNY is just in a few days! As some of you know, I got my Samsung Note 3 around end of last year. I took a picture of it on my Instagram as well. I am so in love with the phone that I browsed through and downloaded various applications for my phone. 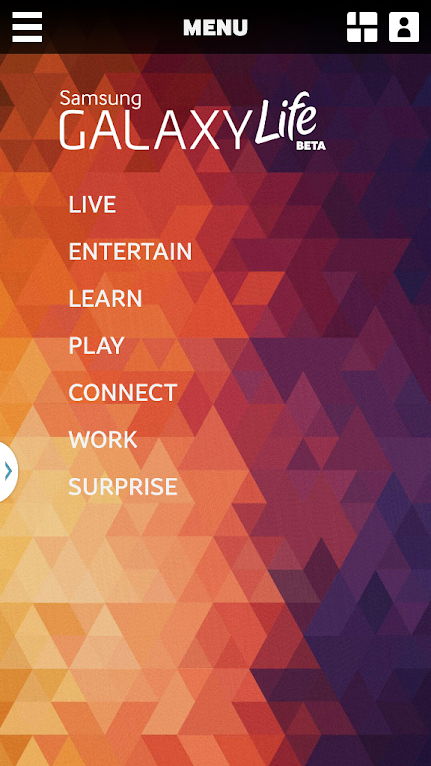 After months of looking through applications on Google Play I suddenly saw an application called Samsung Galaxy Life. To be honest with you I had no clue what the application was about. Thanks to my curiosity that I managed to discover that it is an app for Samsung Smart Phone users with Jelly Bean 4.3, so I believe is applicable for S4 and Note 3 users. This Samsung Galaxy Life app contains deals, promotions, etc (you have to download it to check it out, it's FREE) and everyday there's a new deal or even a new application to download for free, so yes I actually check this app few times a week just to see if there's anything that would interest me. 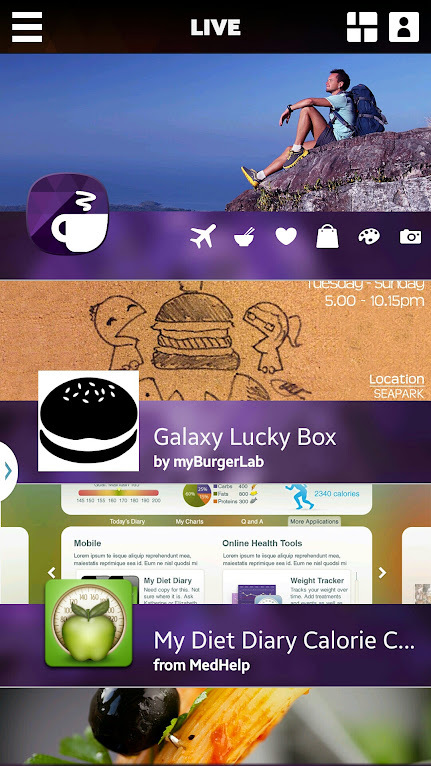 There are 7 pillars under the Galaxy Life app such as the screen shot above. I went into 'LIVE' because it's the first category, I started scrolling down to see what they had to offer. One of them that caught my eye was "Galaxy Lucky Box". What in the world is Galaxy Lucky Box? Titles really do make a difference in creating curiosity, and so I tapped on it and realise is like a lucky draw. I've NEVER stepped my foot into My Burger Lab before. I've heard about it, seen it on YouTube videos, etc but just never got the chance to try their charcoal burgers just because the queue is super long every time I drive by. 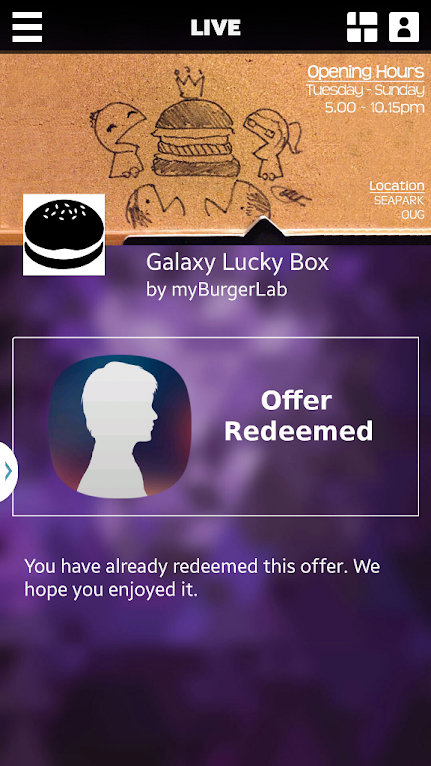 But seeing this offer from the app reminded me that I've never tried My Burger Lab before and now that i'm pretty free I thought hey why not right, and I get to do a lucky draw, sounds like fun. I was chatting with my blogger friend Ashley, and so happen she discovered the app and shared it with me too. The both of us have never tried My Burger Lab and so we decided to go together and redeemed this deal. When we arrived at My Burger Lab I showed this before I placed my order. After placing my order I was given a box filled with small pieces of papers. So I put my hand in and took out 1 piece of paper, opened it and I got a free fries! Luckily I only ordered the Cheese Burger ala carte and not the whole set. 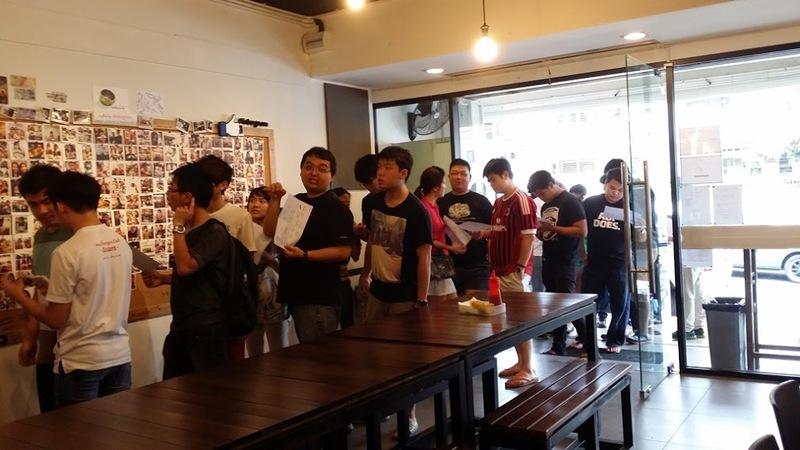 Goodness it was only 5+pm and the queue already so long! 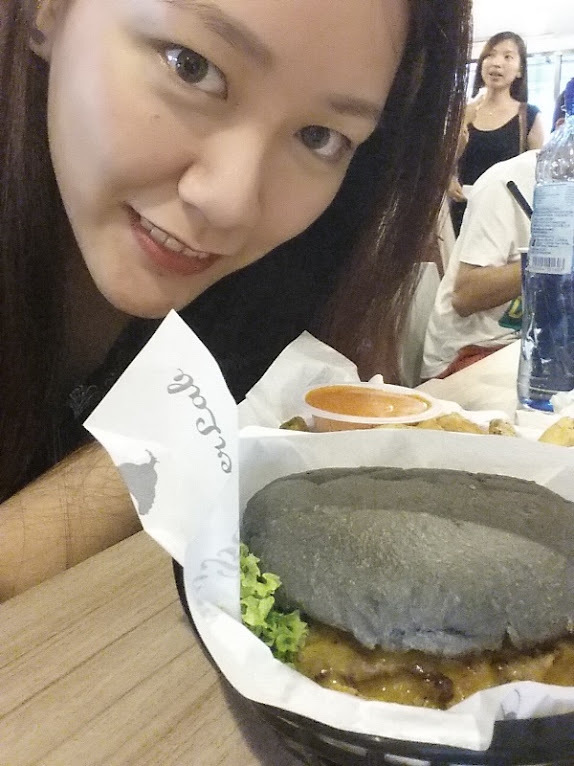 Say hello to my black burger. Lol. I really like the beef patty, it tastes like home made patty and I love their Orange colour sauce, it has a unique taste. 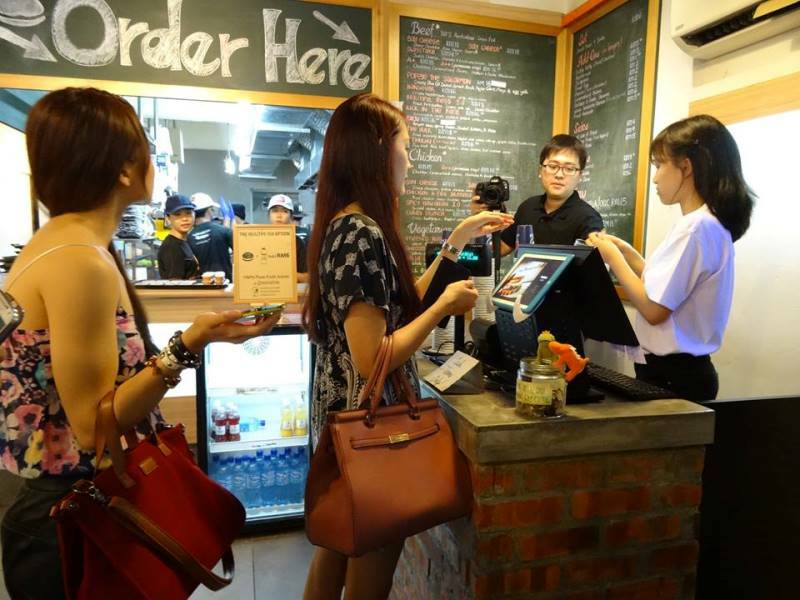 I hope there will be more deals from My Burger Lab because I definitely want to go back and try their other burgers. It feels nice to know that Samsung came up with an app that is only available for Samsung users, it feels kinda grand and not too main stream. I personally feel that this application is good and useful. I do hope they would have more deals for beauty products, activities for travel, and rave parties, :p. Future Music Festival is coming soon Samsung, :p *hint hint*.